There are two pumps in this project controlled by the programmable relay PR200. Their operation depends on the signal value from a temperature sensor and two set points. 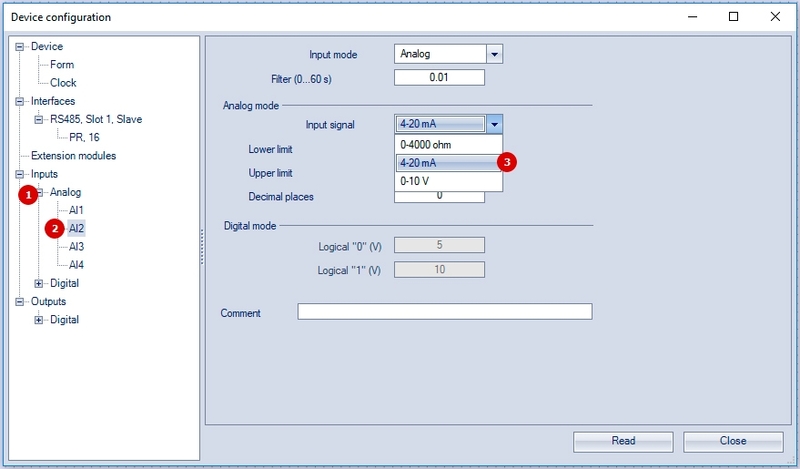 The values of the set points are received from a SCADA system that the PR200 is connected to via Modbus RTU. Both pumps can be stopped by an emergency stop button or through the SCADA system. The temperature values and the status of the pumps are shown on the PR200 display. Some automation tasks require switching on/off a secondary device according to a particular schedule. Schedules are often subject to change. With this sample project, you can learn how to set, and more importantly, to change the schedule of the output activity with the PR200's function keys and its screen. It means, there is no need to rewrite and re-upload your application. Moreover, there are used three macros from our Online Database (“Clock_Mod”, “Day_Week” and “Set value selector”) in this project, so it is a great opportunity to get familiar with them. The objective of this sample project is to provide an example of how string data can be read by the PR200 Programmable Relay and be shown on its LCD display. In this example, the String Data is the TRM202 firmware version that is stored in its Modbus registers. As Modbus Master, the PR200 is supposed to read the firmware string from the corresponding registers over the RS485 serial communication interface. We hope these projects will be very helpful and save your time significantly. What software do I need to program the PR200? How much does it cost? Do I need a specialized cable? You need our programming software ‘akYtec ALP’. It is free of charge. You can find it either on our website or on the USB stick, which is included in the delivery. Yes, you need a cable (USB A-plug to micro B-plug), which is also included in the package. How can I change the parameters ‘Start date/time’ and ‘Stop date/time’ of the functional block ‘CLOCK WEEK’ from the front panel of the PR200 or through a variable in akYtec ALP? Since the ‘CLOCK WEEK’ does not have any inputs you cannot change the parameters of this functional block both from the front panel and through variables. If you need a modifiable ‘CLOCK WEEK’ in your project, two macros are available in the online macro database as well as a sample program that shows how these macros should be programmed. To download the sample program, please use this link, open and look for the sample project 'Modifiable Week Clock'. How can I change the parameters of a functional block (i.e. BLINK, TON, TOFF, TP) from the front panel of the PR200 or through a variable in akYtec ALP? To write to or read from a functional block, it is necessary to use the blocks 'WriteToFB' or 'ReadFromFB', respectively. You can find these blocks on the toolbar ‘Insert’. Can I expand the number of inputs/outputs of the PR200? The main and the simplest way to do it is to use the PRM Extension Modules from akYtec. 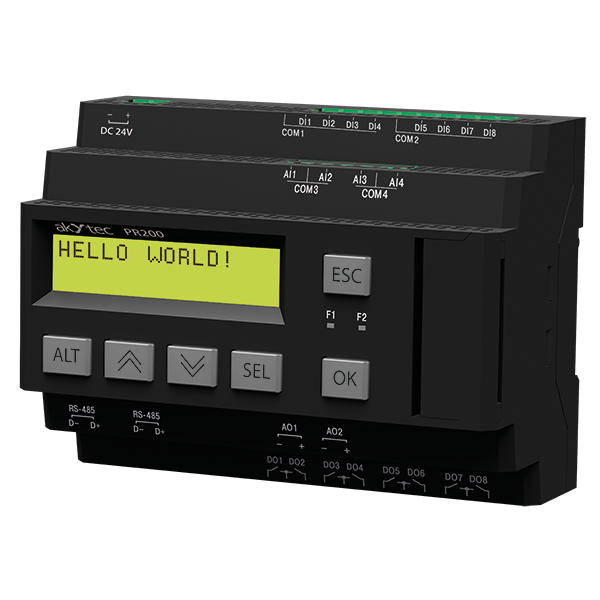 With these modules, you can extend the PR200 by up to 16 additional digital inputs and up to 16 digital outputs. Alternatively, if your system requires more I/O-points, you can use Modbus RTU/ASCII and connect up to 32 expansion modules over the RS485 interface. We recommend using our I/O-Modules of the Mx110 series for this purpose. How can I connect an expansion module of the Mx110 series to the PR200? 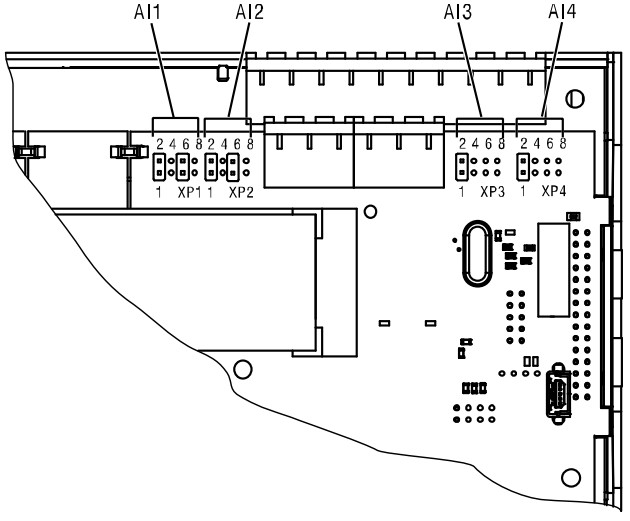 A module of Mx110 series can be connected to the PR200 via the RS485 interface and Modbus protocol. What is the maximum permissible frequency that a digital input of the PR200 can handle in case of using this input to read an impulse signal? This frequency depends on the device variant. In either case, a square wave pulse signal with 50% duty cycle is assumed. Are the relay outputs of the PR200 suitable to control a power contactor? 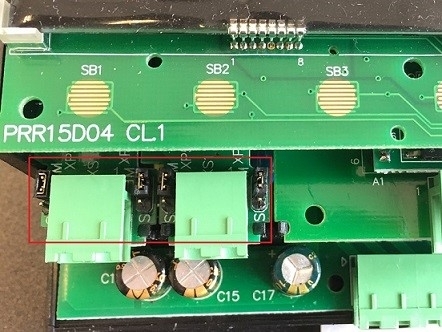 DC: 3 A, 30 V.
Can the integrated voltage source of a PR200-230.X.X be used for feeding an input module Mx110-24.X? What about feeding an ITP16 or ITP14? No, this voltage source cannot be used for feeding an Mx110 module because it doesn’t provide enough current (max. 100 mA). However, this current is enough for both an ITP display or its analog output. What is the minimum voltage and current needed for proper operation of an input of the PR200? PR200-230.X.X: 159 V and 0.75 mA. PR200-24.X.X: 15 V and 5 mA. 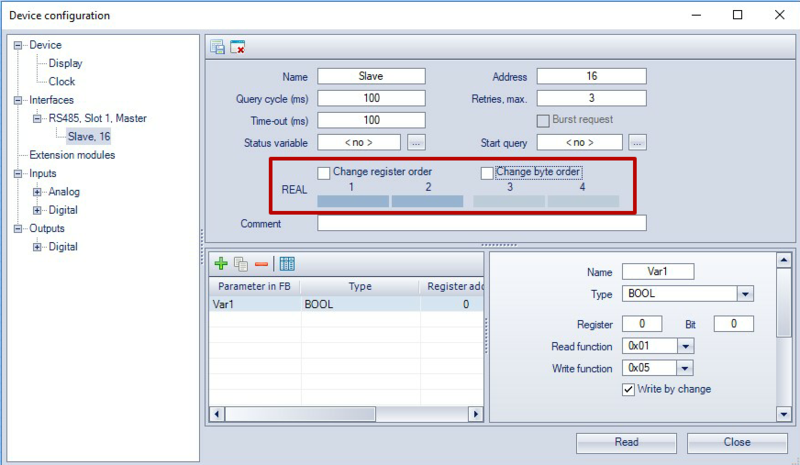 How many variables can the PR200 handle as Modbus Slave? It depends on the type of the variables. They can be either INT or REAL. An INT variable stores data in only one register, while a REAL variable requires two registers for this. 32 if you declare only REAL variables. If there are both INT and REAL variables, you should calculate their maximum permissible number according to their combination. For example, if you declare 10 REAL variables, which is equal to 20 INT variables, you can declare up to 44 INT variables (64 - 20 = 44). How many Modbus Slaves can the PR200 control as Master Device? The PR200 as Modbus Master can control up to 16 Slave Devices over each RS485 interface. 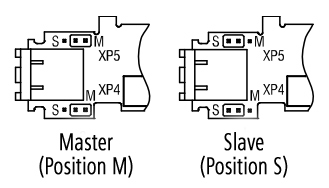 Each Slave Device can process up to 256 variables. I have a PR200 with 2 RS485 interfaces. Is it possible to read some data from a Modbus Slave Sensor over one RS485 and make them available on the other? Yes, this application is possible. I have set Slot 1 to Master on the Device Configuration dialog box in akYtec ALP but it doesn’t work properly. What should I check? - there are terminating resistors at both ends of the communication bus. Experience shows that the most efficient practice is to use terminating resistors of 150 ohm. In what numeral system should be written the register address, decimal or hexadecimal? The register address has to be written in decimal. I have connected a slave device to the PR200. I can read INT variables but I am having problems with REAL variables. I want to show a value on the display but it shows a different value that doesn’t make sense. What should I check? To read and show REAL variables, it is important to know the endianness of the registers and bytes, i.e. register and byte ordering. It can be either big-endian or little-endian format. If you use the big-endian format, the register or the byte that contains the most significant bit is sent first, followed in a decreasing significance order. The little-endian format has a reversed order. How should I configure an analog input of the PR200? All analog inputs are set to 4-20 mA in the delivery state. - Click Close to save and exit. 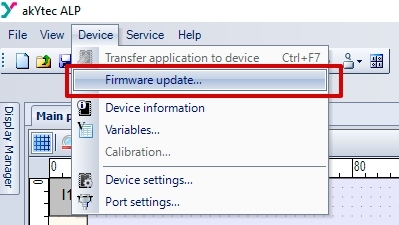 The button 'Transfer application to device' is not available. What should I do? You need to update the firmware in the ‘Down.Mode’ mode. Select your device from the list and press the Select button. How many PRM modules does the PR200 support? Maximum two modules can be connected in series to PR200. With these modules, you can extend the PR200 by up to 16 additional digital inputs and up to 16 digital outputs. Alternatively, if your system requires more I/O-points, you can use Modbus RTU/ASCII and connect up to 32 expansion modules over the RS485 interface. We recommend using our I/O-Modules of the Mx110 series for this purpose.